Old Charis Books and More Sign at 419 Moreland Ave.
We will be celebrating 43 years of feminist bookselling this fall and we are always celebrating our stories. These stories are written in poetry, biography, short stories, plays, essays, songs and novels. These stories are told in circles--circles of women, circles of children, circles of dreamers, circles of men seeking hope, all making justice. Some stories are read to huge crowds, others are spoken in whispers, one by one. Some stories are found in books, while others emerge from our own hearts as we recognize ourselves in someone else's eyes or words. For over 43 years these stories have been weaving themselves together and finding voice in our little corner of Little Five Points in Atlanta, Georgia. We call this space a feminist bookstore. We call this space "Charis," a Greek word that means grace, gift, thankfulness. 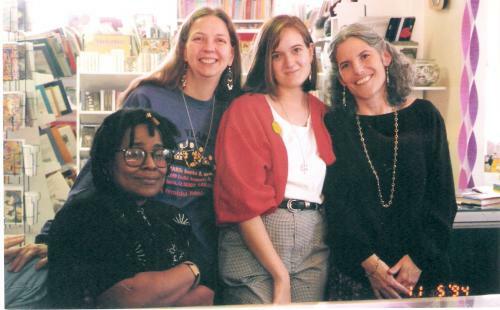 "Atlanta's Charis Books and More: Histories of a Feminist Space"
Publisher's Weekly (05/13/13): "Making Nonprofit Stores Pay Off"
Below you will find some books that contain further Charis history. From the 1970s through the 1990s more than one hundred feminist bookstores built a transnational network that helped shape some of feminism's most complex conversations. Kristen Hogan traces the feminist bookstore movement's rise and eventual fall, restoring its radical work to public feminist memory. For a brief history of Charis' early years please read "'Women Ran It' Charis Books and More and Atlanta's Lesbian-Feminist Community, 1971-1981" by Saralyn Chesnut and Amanda C. Gable. A brief pictorial history of LGBT Atlanta, with a mention of Charis. Includes a brief write-up about Charis.